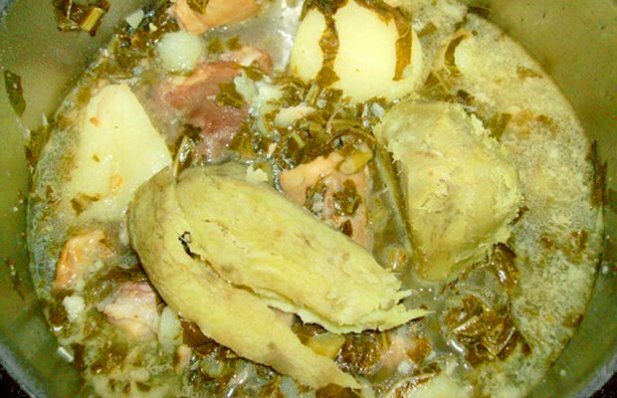 A traditional Kale and Pork Stew from the island of Corvo in the Azores. First cook all the pork parts and tenderloin in a saucepan with water for 10 minutes on medium heat. Remove the water from the pan, and add it to another saucepan. 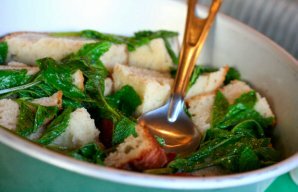 Bring the broth in this saucepan to a boil, and add the pork, chopped kale, and potatoes. Add the pork lard and salt to taste. Cook for 30-40 minutes on medium heat until the pork and potatoes are done. Pour into bowls and serve with Pão de Milho, or Portuguese corn bread. If you don’t have Pão de Milho, use regular toasted bread. 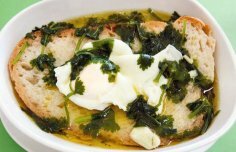 This delicious Portuguese Holy Ghost soup recipe (Receita de sopas do Espírito Santo) is very easy to make. 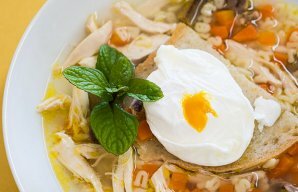 This tasty Portuguese chicken soup with poached egg recipe (receita de canja de frango com ovo escalfado) is great for a cold day or if you are feeling a bit under the weather. How to make Portuguese soup from Alentejo (Açorda Alentejana).